13"x 24" red INSTRUMENT REPAIR LED sign with flashing blue action! 13"x 24" yellow JEWELRY REPAIR LED sign with flashing blue action! 13"x 24" red and yellow BODY PIERCING LED sign! 13"x 24" multi-color TATTOO LED sign! 13"x 24" red and yellow BBQ LED sign! 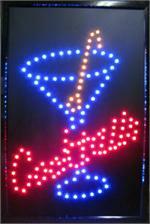 24"x 16" red and blue COCKTAILS LED sign! 14"x 23" oval profile red PIZZA LED sign with flashing blue action! 13"x 24" red PAWN SHOP sign with flashing blue action! 13"x 24" red & yellow WE BUY GOLD LED sign! 13"x 24" red COFFEE LED sign with flashing blue/green action! 13"x 24" OPEN 24 HR LED sign with flashing blue, yellow and red action! 13"x 24" red OPEN LED sign with flashing blue action!